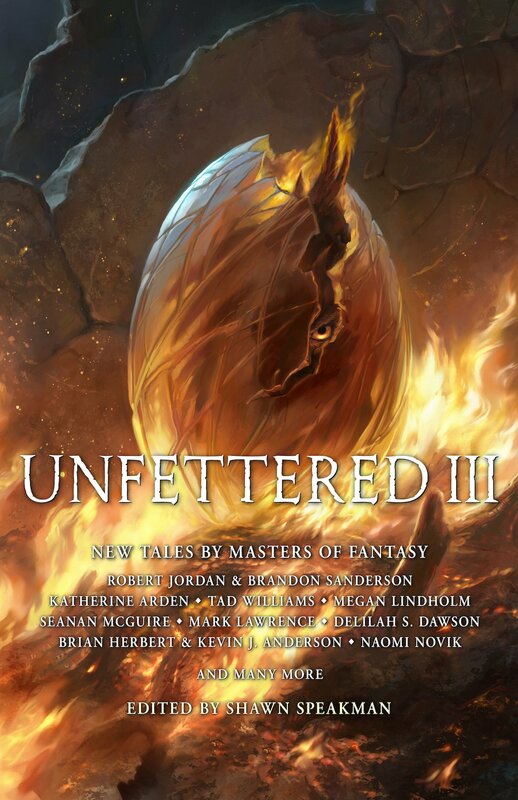 Unfettered III, the fantasy anthology from Grim Oak Press, is now available for purchase. The book features stories from some of today's top names in fantasy literature including Terry Brooks, Lev Grossman, Delilah S. Dawson, Seanan McGuire, Naomi Novik, and Tad Williams. It also, very notably, includes a new "deleted novella" from Robert Jordan & Brandon Sanderson, as well as a short story from Dragonmount founder Jason Denzel. A Fire Within the Ways is the name of the deleted sequence of chapters that was originally written for A Memory of Light. It's a non-canon story that features Perrin within the Ways. Here's a portion of what Brandon had to say about it: Brandon's blog post about the story. You can read its opening portion for free on Tor.com, and join a discussion on our forums. In addition to the Wheel of Time story, Unfettered III includes a short story from Dragonmount founder Jason Denzel entitled, "The Stone Golem of Qual'Jom." From Jason: You can read more about that story on Jason's website. Unfettered III is currently available in hardcover and ebook. An audiobook edition is coming soon. The publisher reported that they've had some issues with Amazon, and are working to get the book available there. But in the meantime you can get the ebook edition from other vendors such Barnes & Noble and Kobo. Our friends at Grim Oak Press announced today that their upcoming short story anthology, Unfettered III, will contain an unreleased deleted chapter from A Memory of Light, the final book in The Wheel of Time series. The chapter will follow Perrin as he makes his way through the Ways. There's about 20,000 words of content, which is about the length of two or three hefty WoT-sized chapters. The content was written by Brandon Sanderson during his process of creating AMOL. It was deleted by Harriet as part of the editorial process, but will now be released with everyone's blessing. Although fun to read, Brandon informs us that these scenes are not considered canon. The original Unfettered anthology, released in 2013, contained "River of Souls", a series of short scenes featuring Bao the Wyld as he attempted to discover the location of a legendary sa'angreal. In addition to featuring a Wheel of Time story, Unfettered III will also feature an original short story from Dragonmount founder Jason Denzel. Here's how Jason described the story: "The Stone Golem of Qual’Jom” is about a lonely, blind creature made entirely of stone who was brought to life by a sorcerer in order to be his assistant. When the master leaves his cavernous lair to go on a long journey, the golem is charged with defending the dwelling from invaders. But during his master’s extended absence, the golem begins to question his nature, and the nature of the world around him. Touching on themes of loneliness and non-duality, and filled with action, “Stone Golem” is my earliest, and one of my most beloved, written stories." 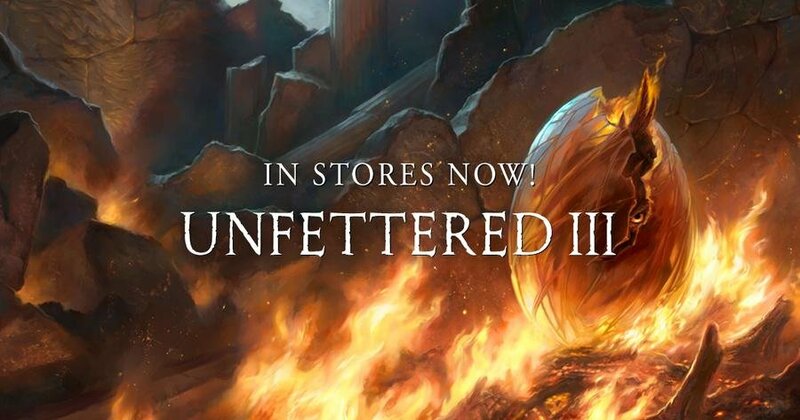 Unfettered III will be released in hardcover and ebook formats on March 19, 2019. It will feature stories from 27 fantasy authors taking place in an abundance of beloved fantasy worlds including the Dune universe. There are 250 early Advance copies available, as well as signed copies, which will contain signatures from all contributing authors, including Brandon Sanderson and Jason Denzel. Finally, proceeds from sales of this anthology will go to a good cause. They will be used to help provide health insurance for science fiction and fantasy writers who need such assistance. We hope you'll join us in checking out these amazing stories. For more information, including links to pre-order the book, visit the Grim Oak Press website. Read Brandon Sanderson's announcement on his website. I'm so sorry. I'm so very sorry. Is there any effort to create a statue for Robert Jordan's memory? There are actually a few public memorials in Charleston already. There is a display about his life in the library at the Citadel, the College of Charleston has his papers and the hospital where he was treated (can't recall the name right now) has a tree named "Avendesora" in it's memorial garden. Every design they released prior to Jordan's death was personally approved by him. Everything since then has been approved by his estate, which means Harriet. I've purchased several of their pieces over the years, both for my own use and as gifts, and have always been very pleased with the craftsmanship and quality. I tend to buy in person, not online, so I can't speak to the ordering experience. But all the Badali folks are super nice and very helpful. The nearest real-world analog is a member of Congress or Parliment in a national government. They represent the interests of their Ajah in the Hall of the Tower. Jordan based much of their procedures and rules on the College of Cardinals in the Vatican. Best Wheel of Time resources? Yeah, please post links. I'll periodically go and update the first post with your suggestions. The old thread was pretty outdated, so I decided to make a new one. What are your favorite resources for keeping track of everything? Hopefully, they are better than the tattered scrap of notebook paper with TIGRAINE=SHAIEL??? scrawled on it that I used to carry around with me in middle school. Since the final books were released a few years ago, we lifted the spoiler ban. We'll try to keep really big revelations out of the thread titles, but other than that, browse here at your own risk. Pointless Sanderson bashing and arguing over said bashing has been deleted. Unfortunately, the CCG wasn't very popular with WoT fans. I don't know of any fans of it personally. Good luck with your sales though. Mountains of Mist.. a Wheel of Time Blog - Just launched. JenniferL replied to mountainsofmist's topic in Introduce Yourself! Looks pretty cool, dude. Good luck! There isn't a big event planned, but we will mark the occasion.